Comments: Cubensis is a small, brownish-black ground cricket that is similar in general appearance and color to palustris but is not as solid in coloration, possessing patches of pale grayish-buff markings (Hebard, 1813; Johnstone and Vickery, 1970). The tegmina typically have a pale line that separates the dorsal and lateral fields. Singing Behavior: Fulton (1931) describes the song of cubensis as a very high pitched, thin whistle. Each trill lasts from 8 to 15 seconds, occasionally up to 30, with similar length pauses between trills. Each trill starts soft and builds in amplitude, ending abruptly. 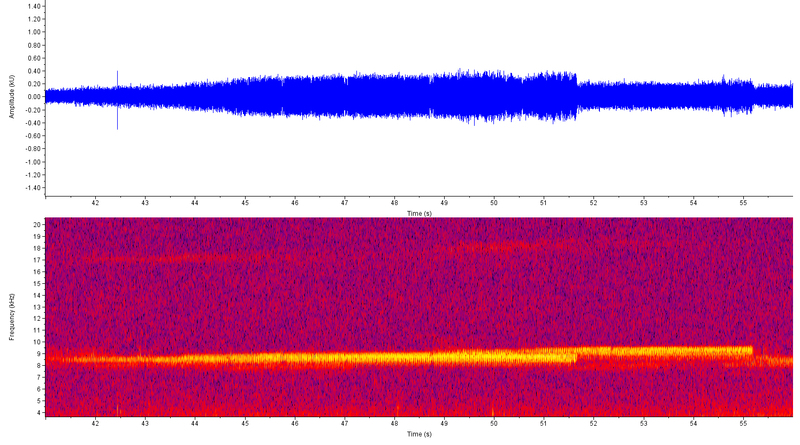 According to SINA, the pulse rate ranges from 38 pulses per second at around 65 F up to 60 at temperatures above 80 F. The pitch of songs recorded in the Macaulay Library range from 6.9 to over 9.5 kHz. 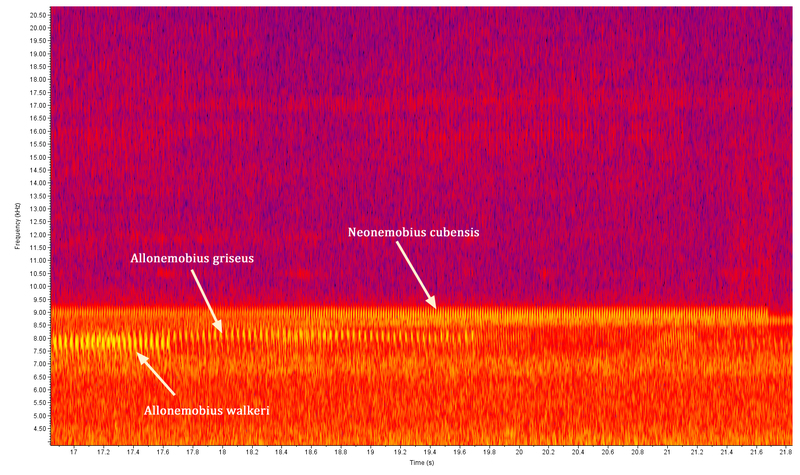 Allonemobius griseus has a similarly high pitched trill that also increases in amplitude. However, it has a slower pulse rate of only 30-40 pulses per second. The habitats of the two species also differ, with cubensis preferring marshes or other wet grassy areas and griseus preferring very dry upland fields. Comments: This species appears to be widespread and occupies fairly common habitat types. It therefore seems to be secure within the state. Comment: Several individuals calling from the edge of a marsh along the Cape Fear River. Note the increasing amplitude and abrupt end of the trills. Pulse rate = 60 pulses per second at roughly 75 degrees F.
Comment: Recorded while video-taping an Orchelimum pulchellum; in second-growth levee forest next to drainage canal. 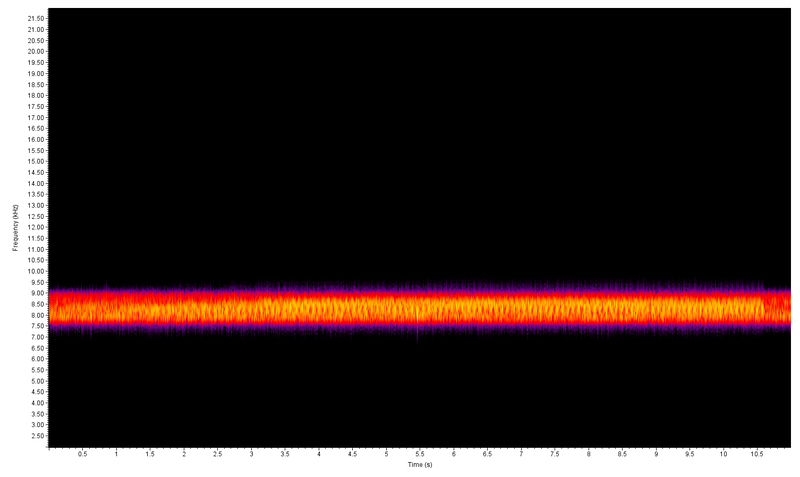 ~60 pulses/sec at about 85 F. 15:20. Recorded late in the year for this species, when both E. variegatus and palustrus are more numerous. However, the high pulse rate and habitat are more consistent with cubensis than the other two.